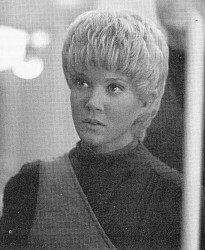 FOR ACTRESS Jennifer Lien it is "the last day of the last episode of the first season" of Star Trek: Voyager, and even at this late date Lien, who plays the exotic Ocampa beauty Kes, still has not quite figured it all out yet. "I really think it's too early to put all this into words. All I can say is that it's just been incredible. It's just been an awesome experience." Lien, a slow, deliberate, highly cerebral thinker, claims her feelings at the audition stage for the role of Kes have pretty much stayed with her throughout the show's maiden voyage. "What went through my mind and what continues to go through my mind has been Voyager's stories, the characters on the ship and the aliens we encounter. I've always been real focused on the work and so I'm very into what's being written and doing my job as an actress. I feel I've been very lucky on this show in that there's always been something to look forward to in every episode." The actress' stake on the character of Kes is a mixture of strengths encapsulated in fragments. "Kes is strong, brave, curious, open and honest. There's a real innocence to her and, most importantly for me as an actress, I see unlimited potential for growth." Lien, continuing to be obscure and maddeningly vague, next offers up her impressions of the inter-alien love affair, a first for Star Trek, with Neelix (Ethan Phillips). 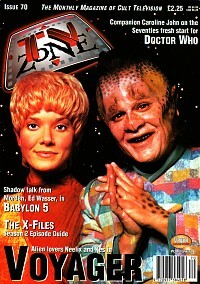 "The relationship between Neelix and Kes has definitely grown and touched on different things. The emotional bonds between them have strengthened and become more defined. Even though these characters are aliens, I think there's a lot that people can relate to." Jennifer Lien was born and raised in Illinois where, with the encouragement of a teacher, she began, at age 13, to perform in theatre productions such as Shakespeare's The Tempest and Othello before making her television début in an episode of the series Brewster's Place. At age 16, and already an acting vet, Lien joined the US soap opera Another World. She temporarily left television at age 18 to do voice-over work, most notably on several bits on Adam Sandler's comedy album, as a guest voice on the animated tv series The Critic, and as the voice stand-in for the English version of the French Horror film Baby Blood. Most recently she appeared in the US television series Phenom. Pressed for more particulars of her Star Trek: Voyager season, the actress pauses and struggles with the question before finally waving the white flag. "I don't know. It just seems sort of too early to be able to put all this in words."